October | 2007 | OK GO! We nailed 4th in the Open Male 4s, missing out on 3rd by just under two minutes. Would’ve pinned down 8th (of 10) in the Pro-Elite Male 4s. The new bikes are awesome. Mild headwind the whole way, sloooow roadwork traffic and every, single, red, light there is and still under 45 isn’t so bad. The Sabbath is for whatnow? Five laps of a short and twisty course for B-Grade. More people seemed to know me than me them (I think it’s the bike) but I made some new friends. 32° felt more like 36 without any acclimatisation. Welcome to summer. Did I really wish for this all winter long? Of course! 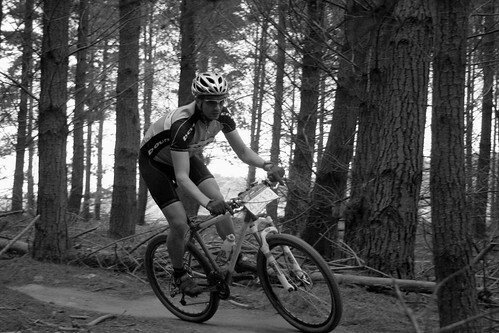 With so much singletrack I knew I’d have to be hard off the line so I channelled Jim and hit it hard off the line. First into the skinny, I led for most of the first lap before a couple of guys, one on a 29er slipped past me. Lap two and three were suckish. I lost sight of the rabbits and everything hurt. Halfway through the third Fee called out that I was coming second and a couple of k’s later I found Mr 2-9 fixing a flat. Lap four was smooth and passed in the blink of an eye. Feeling strong and happy I figured I’d drop the hammer for the final lap, but rode outside myself and had a messy, painful circuit and was glad to see it end. I did catch a few glimpses of Mr 1st, but never made up the time enough to put in a real chase. The winner of A lapped me shortly before I finished, racking up 6 laps in just under the time it took me to turn out 5. Given that I can’t make Jeff’s tonight, why not try out CFV’s Blitzkreig, modded to suit what we have lying aroudn here. Subbed DBs for the snatches which difficult (plates interfering with a nice, close-to-the-body path). Subbed squats for the box jumps for I have no box/bench. Tore a callous off my soggy right hand at pull-up 42. Subbed pushups for the dips because ‘you’re not coming into the kitchen like that’ (fair enough), and the kitchen bench is my only dip station. The farmer’s walk at 40kg (1.8 x BW) was an absolute killer. Double unders just a light salting of the wounds. Form started out very poor: waaay out of practice, catching low and forward. I was pretty disappointed with the weights until I scanned back though the log and couldn’t find anything heavier than 55. Clearly the heavy stuff has been lacking. It feels more like technique than strength that’s holding me back at this point.